Shelter does believe this young boy is blind..an intraocular pressure assessment is needed to assess for possible uveitis or glaucoma. Please, we need to help this guy...he is only 12 months old! How does a 12 months old dog who is blind and barely weighs six pounds wind up at the Riverside County Animal Control? Volunteers begging for help saving this little dog can not imagine his sitting alone in the loud, cold and frightening shelter without someone helping him. 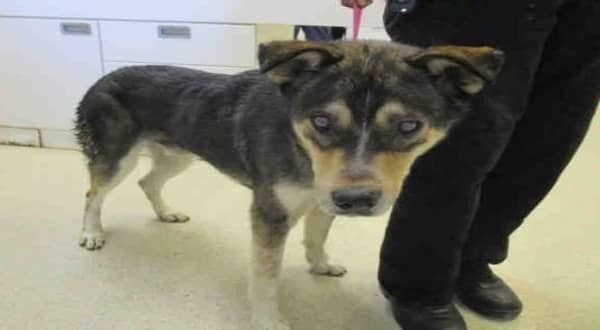 I am a male, tricolor German Shepherd Dog and Siberian Husky. I have been at the shelter since Jan 17, 2018. If I am not claimed, after my stray holding period, I may be available for adoption on 01/22/2018. 1 Response to "12 months old blind Shepherd mix begging to be saved from deadly shelter"